For those who don't have time to make the drive to Outer Banks, there are still some really nice beaches in Virginia Beach. Lots of people flock to the Oceanfront, which I guess is the rough equivalent to Waikiki- high rise hotels on the shore, with nightlife within walking distance. My personal favorite is not the Oceanfront (although the boardwalk is really nice and there's a Dairy Queen at 27th Street), it's a little off the beaten path but not too far. 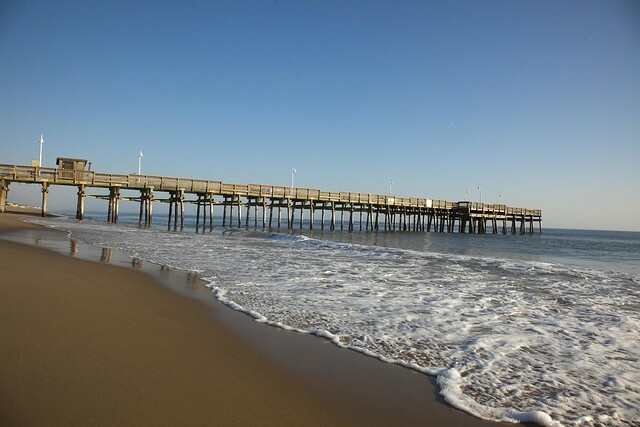 Sandbridge Beach is only a few miles south, and will give you a much better escape/experience, particularly if you are going with the family and like surfing and beach combing. From the Oceanfront, head south on Pacific (which turns into General Booth), turn left on Princess Anne, and follow the signs. It should take roughly half an hour. On the southern side of Sandbridge, there's a park called "Little Island," which is maintained by the City (and therefore you have to pay for parking). It's great for beach combing (you can even find intact cowrie shells), and you can access the backbay side (where it's a little more flat) for kayaking. Oh, yeah... and the fishing pier. :) Something for everyone. On the northern side of Sandbridge is Dam Neck, which belongs to the Navy. I also happen to like this beach a lot. One of my co-workers said when he was stationed there (some 30 years ago), there used to be deer stands ON THE BEACH. How crazy is that? Just hang out on the beach in a deer stand and wait for one to decide it wanted to go for a swim. I have never seen deer here and hunting is no longer allowed, but there is a fishing area and always someone running on the sand. There are lots of private beach homes available to rent in the area. For more information on activities and other amenities in the Sandbridge area, click here. Click here to sign up for updates and lifestyle tips. No spam, 100% secure, totally free.